US Secretary of State Mike Pompeo will personally brief South Korean President Moon Jae-in on the outcome of the historic US-North Korea summit, an official from Moon's presidential office Cheong Wa Dae said Wednesday. The top US diplomat arrived at Osan Air Base, south of Seoul, around 6:20 p.m. Wednesday. It is his first official visit to South Korea since he took office in April. 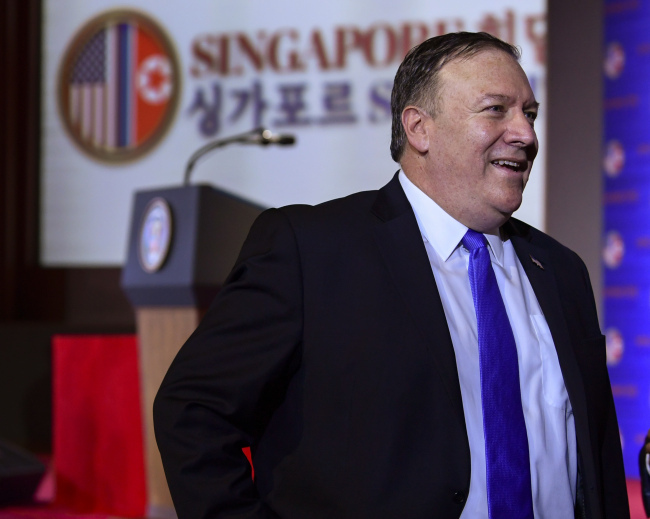 "Secretary Pompeo is scheduled to visit Cheong Wa Dae on Thursday. The president will likely meet him personally," the Cheong Wa Dae official said, speaking on condition of anonymity. A second Cheong Wa Dae official later said Pompeo will make a courtesy call on Moon at 9 a.m. Thursday. Japanese Foreign Minister Taro Kono will also visit South Korea for three-way talks with South Korean counterpart Kang Kyung-wha and Pompeo. Kono is set to pay a visit to President Moon at 3 p.m. Thursday, the official added. Moon was given a personal account of the US-North Korea summit from US President Donald Trump himself in a 20-minute telephone conversation, held only hours after Trump met with North Korean leader Kim Jong-un in Singapore on Tuesday. Pompeo is expected to give a more detailed account of the first-ever US-North Korea summit to Moon and his South Korean counterparts, the Cheong Wa Dae official noted. In a joint statement issued after their historic summit, Trump and Kim said they agreed to improve their countries' relationship, a move that would inevitably require a formal end to the Korean War, in which nearly half a million American troops fought with their South Korean allies. The Cheong Wa Dae official said there were no immediate plans for three-way talks between the two Koreas and the United States to officially end the 1950-53 war or implement other agreements between Washington and Pyongyang. Also, no dialogue has been scheduled between Moon and the North Korean leader, the official added.